Several years ago, I payed a visit to Hocking Hills, a wonderful area close to Columbus, Ohio and about a four hour drive from my home. It was a really great few days photographing with several of my friends, and over the last few years have posted several images taken there on this blog. However, making photographs in the Rock House, which is a cave that had been used by native Americans many years ago, was very difficult because of the extraordinary dynamic range related to various openings letting the light in. I had tried processing the photo in the past by blending seven exposures using various HDR software brands as well as 'Merge To HDR' in Lightroom, but was never happy with the result because somehow the color just always seemed wrong. I recently gave SNS-HDR a try, as there was a Black Friday sale for $18 and I had read comments in various forums that it gave natural looking results. Although there is still a bit of an 'HDR look" (which, frankly, I ended up intensifying a bit in further processing by adding contrast) it left the color very natural looking and requiring only a few tweaks in Photoshop to get it to look the way I remembered it. Overall, I like the result and am pleased with the intuitive SNS interface. 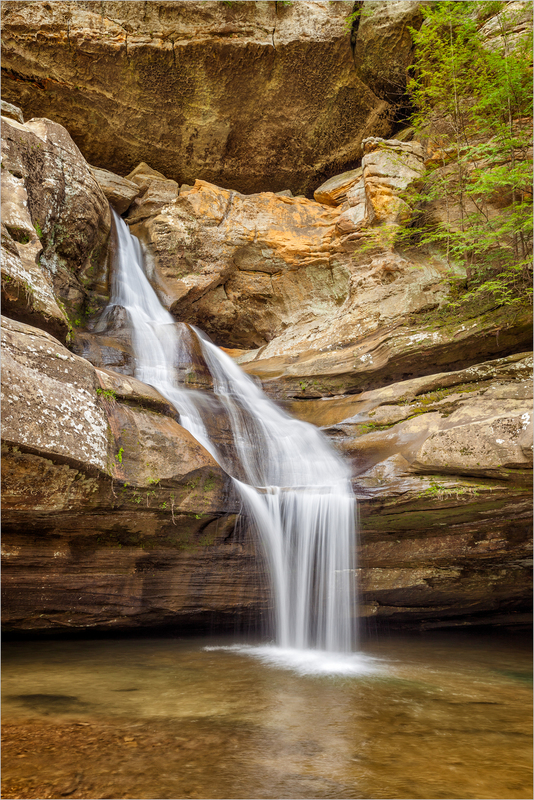 Photographing Cedar Falls was one of the highlights of my trip to Hocking Hills this last spring. The falls is down in a valley of sorts, so there was plenty of time to photograph before the sun rose high enough to 'end the party' by causing bright highlights on the water. While on the hike back to the car, I was walking along the base of a cliff and happened to notice that the sun had risen just over the top of the cliff and was nicely backlighting a group of trees, leaving the rock wall in the shade. The dark rock provided a nice contrasting background for the tree and it looked like a nice 'set up' for a photo. To process this image I first made some contrast and brightness adjustments in Lightroom and then converted it to black and white. Why black and white? In my mind the image was about the contrast and backlight. While the flourescent green of the leaves was interesting, the cliffs themselves had an orange hue and, even though far darker than the green, I thought it detracted from the contrast and lighting which was what had really caught my attention. I liked a quick initial conversion, and, once I saw the direction the photo could take in black and white, I spent some time in Silver Efex Pro getting it to look just the way I wanted. In images like this, care has to be taken to make the backlit leaves bright but, at the same time, avoid having them 'blow out' to pure white. Cedar Falls is the tallest waterfall in the Hocking Hills area and is a pleasure to photograph. Like many of the waterfalls in the area, one sets up from down in a ravine at the base of the falls. That situation is perfect for waterfall photography because the ravine allows the water to stay in the shadows for a longer period of time in the morning than it otherwise would. Once the bright sun starts to hit the water, the party is over because you get bright, blown out highlights and reflections. Let's see.....tall waterfall, beautiful surroundings, plenty of time to make photos before the crowds come, get to sleep just a little bit longer, and not have to rush to get the shot before the sun hits the water directly. What more could you ask for? I think I will definitely be going back at some point. A few weeks back I posted a photo of the 'Upper Falls' at Old Man's Cave, taken on my trip to Hocking Hills outside of Columbus, Ohio. This is a companion photo, made during the same session, as I always try to shoot many different compositions when at a location. Usually I like to avoid having man-made things in my nature photos. But all 'rules' are meant to be broken. In this particular composition I think the inclusion of the bridge adds to, as opposed to detracts from, the photograph. What do you think? A few weeks back, I went with two of my 'photo buddies' to discover a new location....a place we had never photographed. An adventure, if you will. The fun part was that it was going to be a long weekend and though it wasn't what one could call 'nearby' it also wasn't all that far away. At four hours by car it was not going to be an unreasonable idea to go back during another season if it ended up being a location we really liked. And so off we went to Ohio's Hocking Hills, a conglomeration of five parks right next to each other. It turned out to be a great trip and a beautiful area. Needless to say, I will be showing several images from there in the coming weeks. 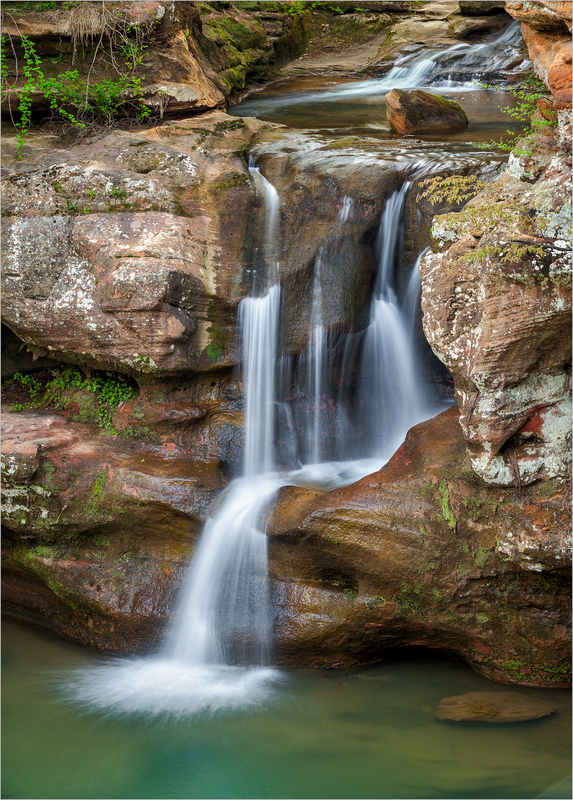 This particular photo was taken at the "Upper Falls" in the area of the park known as Old Man's Cave (yes, an old man did live here for many years under a large rock outcropping reminiscent of a cave). I was able to frame several compositions at this location, but my favorites were this one and another that shows the stone bridge over the falls. I am still working on that one. Oh, and I think that we will be going back to this area at some point! !